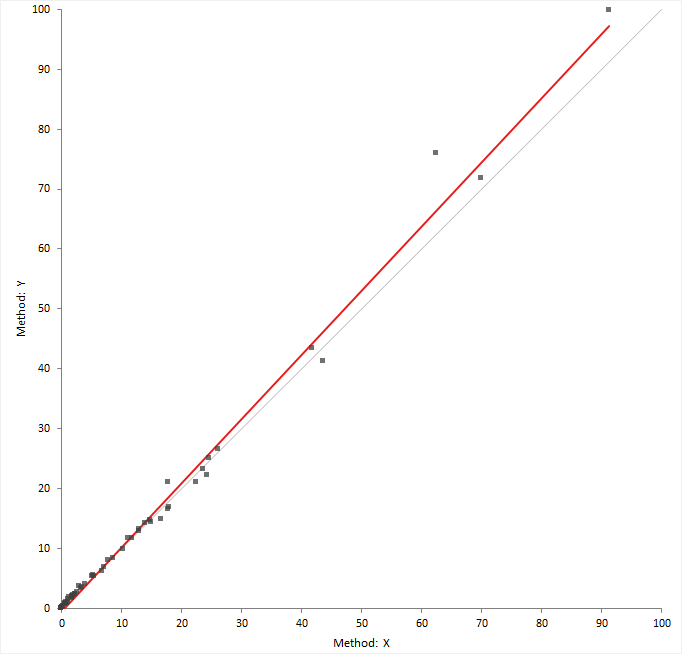 The scatter plot shows measured values of the reference or comparison method on the horizontal axis, against the test method on the vertical axis. The relationship between the methods may indicate a constant, or proportional bias, and the variability in the measurements across the measuring interval. If the points form a constant-width band, the method has a constant standard deviation (constant SD). If the points form a band that is narrower at small values and wider at large values, there is a constant relationship between the standard deviation and value, and the method has constant a coefficient of variation (CV). Some measurement procedures exhibit constant SD in the low range and constant CV in the high range. If both methods measure on the same scale, a gray identity line shows ideal agreement and is useful for comparing the relationship against.